Prevent Frozen Pipes: It’s that time of year! Well it’s winter again in beautiful Connecticut, whether you live by the water or inland we all have to deal with the possibilities of “frozen pipes”. Let’s explore some preventative measures that could save you from this experience. 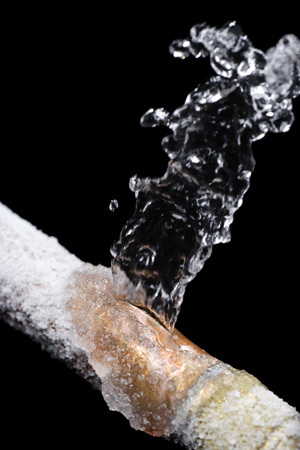 Prevent frozen pipes caused by a drop in temperature: The number one cause of frozen pipes is, of course, that it is cold, not just 32 degrees out but I mean cold, 20 degrees or lower. 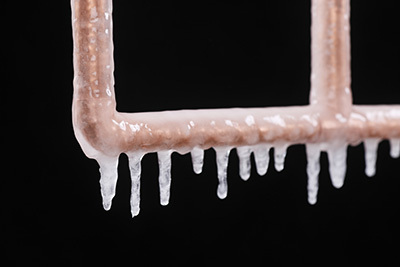 These kind of temperatures put an enormous pressure on your plumbing, from the boiler working hard to keep your home comfortable to the outside faucet you forgot to shut off that is now frozen solid. Prevent frozen pipes caused when wind is added to low temperatures: The second cause of frozen pipes is wind, yes wind. That frigid breeze will find any crack in your foundation or poor seal around a door or window to quickly lower the temperature in the walls and floors. It makes it much colder than the interior of your home, to cause, yup, you guessed it, frozen pipes. Prevent frozen pipes caused by turning the thermostat down too far to save money: The third major cause of frozen pipes is the human factor, you’re trying to save money, so when you go out you turn down the heat. I don’t blame you, I do the same thing, but too big of a temperature swing and those places in the walls and floors reach freezing temperatures long before the heat kicks back on. This will result in frozen heat pipes as well as water pipes, and yes the hot water pipe will freeze first. Some of you don’t believe that but it is true. How can I avoid these common pit falls and stop my pipes from freezing? Well I thought you’d never ask, here are some tips that will help. Prevent frozen pipes by insulating the most vulnerable pipes: First, identify those areas of your home that contain plumbing and are exposed to the cold. Like crawl spaces, attics, unheated basements, and garages. Locate any pipes in those areas and wrap them with insulation. Prevent frozen pipes by shielding them from the wind: Second, find that area the draft is blowing in and fill the crack, caulk the joint, and fill that hole! Stopping that draft will prevent frozen pipes, and help you save in fuel costs. Prevent frozen pipes by not turning the thermostat down more than 10 degrees: Third, when you head off for work or any other reason that you will be gone for long period time do not turn your heat off or the thermostats down too low. I recommend keeping your home no lower then 65 degrees and do not adjust the thermostat greater then a 10 degree swing. So if you’ve been home all night had the house at 72 now your heading off to work, you walk by the thermostat, what’s the lowest you should turn your heat down to avoid frozen pipes? Answer 62. I hope this helps you stay warm and comfortable this winter and if things do go wrong you know who to call. Frozen pipes happen. We understand. We understand how it feels to be faced with the inconvenience of no running water, no drinking water, no showers! And then, there’s the water damage: Carpets, furniture, ceilings and walls, mold, new pest habitat…wow! Get it taken care of immediately, and professionally. Please give us a call now and we’ll wrap those vulnerable pipes and seal the cracks, or quickly get the water running again if you’re already experiencing a frozen pipe disaster.